This week’s Wear Your Style Friday trades in our usual Brooklyn backdrop for one a bit warmer and more sunny. And it provides a first peek at our new spring pattern line! Last month I spent a weekend in Palm Springs as a guest teacher at one of Heather Ross’s Weekend Sewing workshops. In honor of our location, I thought I’d make up one of the new spring Lisette patterns, the Diplomat Dress, in one of our spring prints. 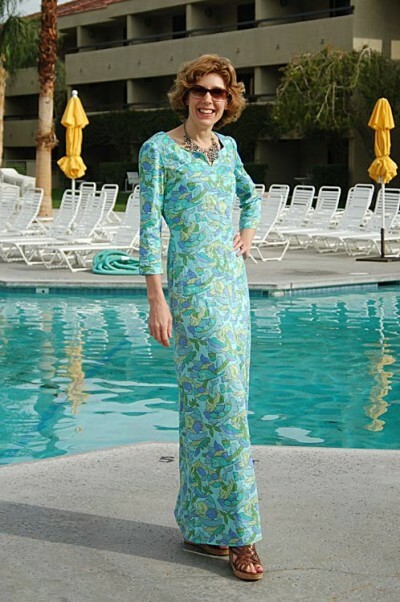 The dress comes in three lengths (mini, just above the knee, and maxi dress) and three sleeve styles (sleeveless, short-sleeves, and three-quarter-sleeves) so I mixed it up a bit and added the three-quarter-length sleeves to the maxi dress for a caftan style ensemble. This pattern, along with the other new spring styles, will be available on our website within the next day or two. (We’re waiting for that nice FedEx man to arrive at the warehouse; he’s supposed to be there later this afternoon.) We’ll be showing you more of the spring styles in the next couple of weeks, so stay tuned for that. Spring must be just around the corner! oooh, could you pick a better backdrop for that lovely print?! Very cute dress and it looks great on you! I love it! Will these patterns also be sold in Joann stores? Can’t wait to see more! The dress is adorb. Lindsay, yes. Patterns should be arriving in all Jo-Ann stores over the next couple weeks. Oh! Can’t wait to buy this pattern! Super cute dress! And the fabric is darling too. How exciting, I cannot wait to get my hands on the new patterns. The fabric looks fabulous too, sadly not in the UK though, although the colour would never look as vibrant in the dull light here. Psst – you can see some details of these on the Simplicy site too. I like this dress pattern! This is gorgeous, love the dress and the print. This would work all year round in the climate where I live. I’ve just been checking out the new Lisette patterns at Simplicity.com and must say I am really impressed (and super happy) that the new patterns are available for digital download. It makes it easy and affordable for me to get these patterns in Australia, where patterns (and everything else) are always more expensive. I don’t suppose you’ll be making the other Lisette patterns available for digital download sometime in the future?